Home » Christmas food » Eat, drink and be merry this Christmas! Chestnuts roasting on an open fire: a classic Christmas scene, thanks to Nat King Cole’s The Christmas Song. But traditions evolve – and today we’re more likely to be digging in to a tin of Quality Street on the sofa, than toasting chestnuts around a log fire. That said; there are some festive food traditions that stand the test of time. Mince pies, mulled wine, turkey, ham, ‘pigs-in-blankets’, cranberry sauce, the cheese board, Christmas pudding, Christmas cake… and your family’s customary way of reinventing the turkey (in our house, it’s pie or soup). At the New Street Butchers & Deli, we are proud to say that we can fill your Christmas pantry with festive delights. Our free-range turkeys and hams are incredibly popular – orders roll in thick-and-fast throughout November. If your preference is beef, lamb, pork, or game, we can ensure you have the finest for your Christmas table, along with tasty handmade chipolatas wrapped in our 12-day cured bacon. Our deli, now into its second year of business, is well stocked with all the little extras that conjure the flavours and scents of the season. For the run-up to Christmas, we have homemade mincemeat, mince pies and lots of tipples and nibbles. And for the main event, the Christmas dinner, we have goose fat for perfectly crisped roasties, an array of stuffings, cranberry sauce, redcurrant jelly, bread sauce, beautiful fresh gravies, and our homemade Christmas puds. Our special Christmas chutney is the perfect complement to a slice of cold ham. 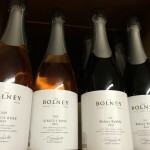 A glass of Bolney bubbly teams up beautifully with a slice of Italian Panettone. Christmas dinner ends sublimely with a platter of tangy, locally produced cheeses. We’ve thought long and hard about how to make your Christmas taste sensational – and we reckon we have every seasonal indulgence covered! If you’re seeking the perfect gift for someone that appreciates the best foods, then you’re in the right place. 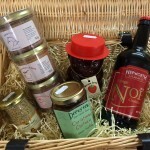 Hampers and boxes cost £5 and can be filled with anything that tickles your fancy, from fine cheeses and liqueurs to chocolates and shortbread. Our raspberry vodka is lip-smacking stuff, our macarons are so pretty, and our Hepworth Christmas ale and gift packs are a beer lover’s dream. 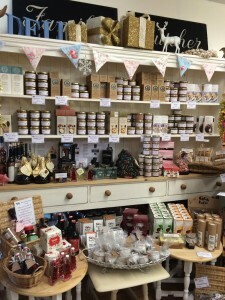 Please come and browse our shelves, which are bursting with delicious local produce. 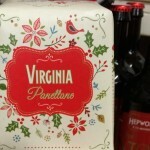 Christmas isn’t Christmas without the evocative flavours and fragrances we enjoy year after year. For festive family food that you can savour together at this happy time, trust us. We’re delighted to play a part in making your Christmas truly special.